Williams Transco is planning to build a new 42 inch diameter, 1480 psi gas transmission pipeline through Lancaster County, Pennsylvania using an entirely new route that does not follow any existing pipeline routes. The purpose of this site is to provide county residents with central access to information about the proposed project, much of which is only available via numerous separate sources. Whether supportive, opposed, or indifferent to the pipeline, it is part of our civic duty and our obligations to our successors to form our positions and responses in a fully-informed manner. Click here, or on the picture above, to explore the areas affected by the current pipeline route and to locate any address with respect to those areas. Williams publicly distributes, and has included in their FERC filing, an illustration labeled "How Williams Builds Pipelines", which shows a pipeline construction zone that is only 30-40 feet wide. The photo above shows what the type of 100 ft wide construction zone that Williams specified in their FERC filing actually looks like. Click here for more pictures and details on the construction process. 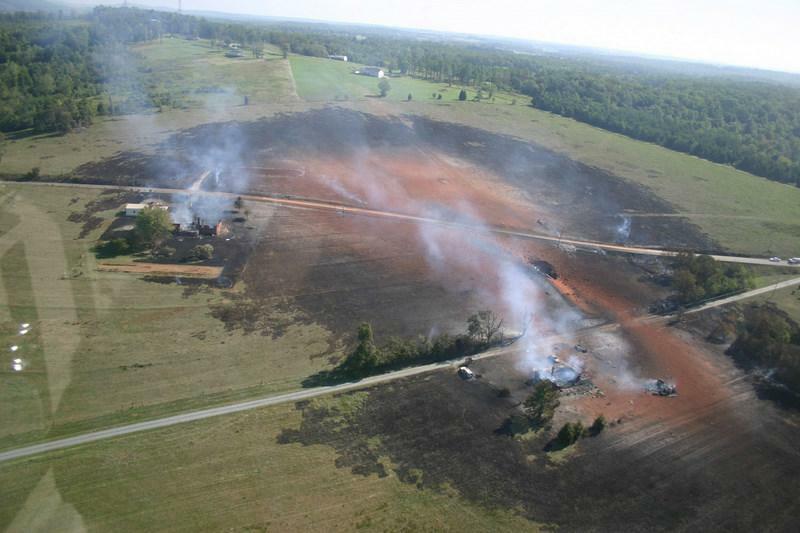 Williams was unable to detect the corrosion that resulted in the catastrophic failure (shown above) of one of their 30 inch gas pipelines in Virginia in 2008. Click here to learn more about the long-term safety hazard that will be introduced to 9,400 acres of Lancaster County by the Williams Transco Central Penn Line South project. As pipelines age and corrode, at some point they must be replaced or abandoned. Once a pipeline route is established, it becomes a likely place to run more pipelines in the future. Click here to learn more about these pipeline lifetime issues. The Federal Energy Regulatory Commission (FERC) has jurisdiction over the Williams Central Penn Line South pipeline project and ultimately will approve or deny it. The approval process is currently in the Pre-Filing stage - the only stage of the process where general public comments are considered. Click here for instructions on how to submit your thoughts to FERC.